Transitions between two input clips using a bright glowing glint. The clips dissolve into each other, while each one gets a glint which ramps up and down over the duration of the effect. The Dissolve Amt parameter should be animated to control the transition speed. Glint Threshold: Default: 0.7, Range: any. Threshold Blur: Default: 0.1, Range: 0 or greater. Increase to smooth out the areas creating dissolves. This can be used to eliminate dissolves generated from small speckles or to simply soften the dissolves. 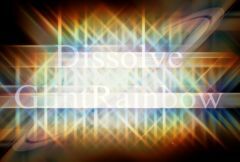 Increasing this may put more highlights below the threshold and darken the resulting dissolves, but you can decrease the Threshold parameter to compensate. Rel From Bright: Default: 1, Range: 0 or greater. From Threshold: Default: 0, Range: any. Rel To Bright: Default: 1, Range: 0 or greater. To Threshold: Default: 0, Range: any. Shift Out: Default: 1, Range: any. Shift Red: Default: 0.3, Range: any. Shift Blue: Default: -0.3, Range: any.